Learn about the supplier's production and trade capabilities. Download detailed reports for free. Get to know the top products that are manufactured by the suppliers. See the actual onsite video produced by Alibaba.com and confirmed by a third-verification company. 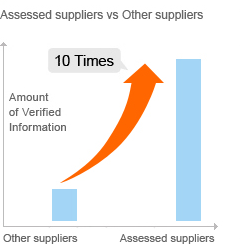 Assessed suppliers offer 10 times more verified information than other suppliers. All Supplier Assessments are conducted by professional inspectors from Bureau Veritas and T锟斤拷V Rheinland. Where can I find assessment reports and verified videos? 1. Assessed supplier on Alibaba.com have the following logo: 2. View Assessment Report on the Trusspass Profile. To learn more about Supplier Assessment, click here.